Time will not always on, after two minutes of inactivity, the display will be darken, if you want to wake it up please tap. If you want the time always stay, please set Bluetooth Mode(BLUE) and leave it alone. 2 minutes later time will show and never go off. 2. How to switch 12/24H system? Want standard time? Press forward or backward button to switch it, very easy! 3. How to set the Alarm? Press MODE twice, you will see the alarm clock function. Hold the MODE button, the hour will begin to blink. Adjust with forward and backward buttons until reach the desired hour. Press MODE and repeat the same operation to set minute and alarm ON. 4. How to set my favorite music as alarm sound? Create a folder which is named “ALARM” in your micro SD card or USB Flash Drive, put your alarm sound in this folder, that’s all. 5. How to freeze the beautiful color? 48 colors cycling automatically, If you want a certain color, please put your hands on it and hold still until your favorite color appears. 1. Main Material: ABS /Silicone. 2. Bluetooth Version: Bluetooth 4.0. 4. Charging Time: 6 Hours. 5. Support TF/USB: 1 – 32G. 6. 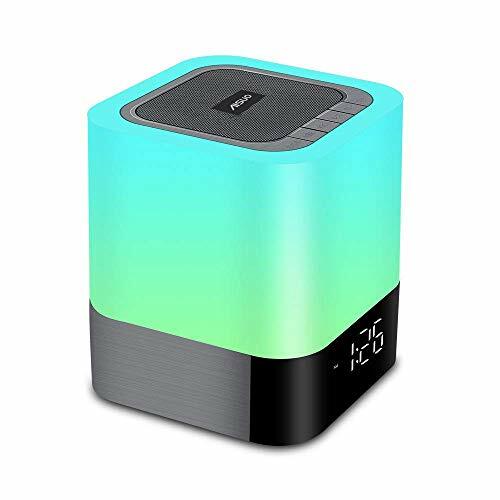 Battery: 4000mAh Built-In Lithium rechargeable battery, it is unnecessary to worry about out of power. My dear customer, if you have any question about this item please feel free to contact with Aisuo. 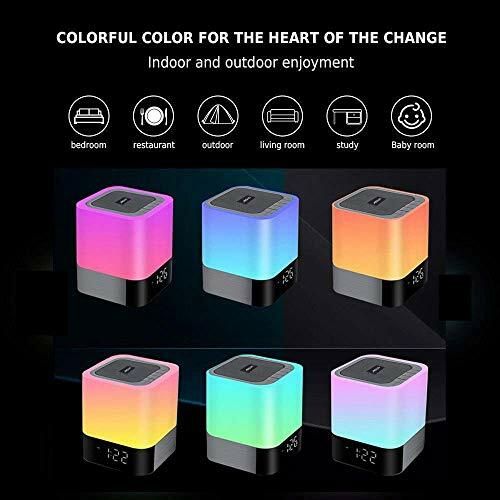 -1 x Bluetooth Night Light Speaker. -1 x USB Charging Cable. 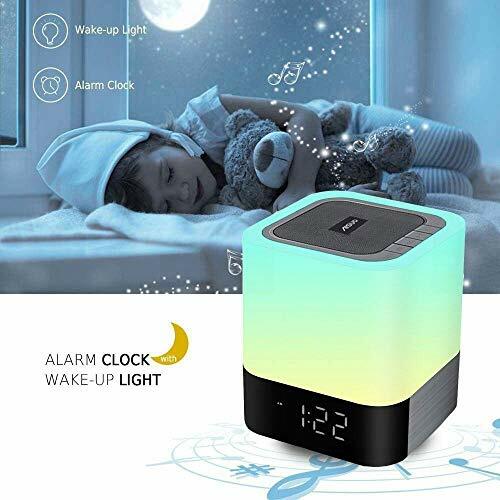 -1 x User Manual.► TOUCH CONTROL NIGHT LIGHT + BLUETOOTH SPEAKER + MP3 PLAYER + DIGITAL ALARM CLOCK + DIMMABLE NIGHT LIGHT: 5 in 1, 48 colors optional, light changes color following with the different volume and rhythm. 3-Level brightness adjustable with the cool touch sensor design, warm led night light can create comfortable environment for you. 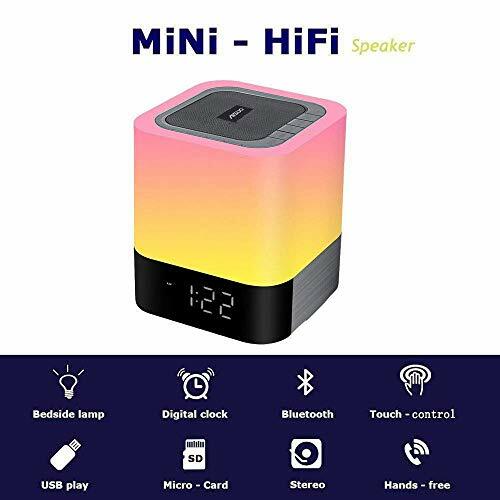 ► BLUETOOTH 4.0 HiFi SPEAKER: Easily connected with most Bluetooth-enabled device, 33Ft/10M Bluetooth range. 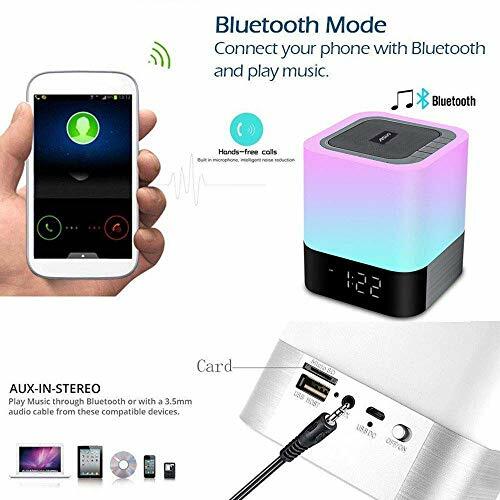 With the help of high power woofer and unique bass technology, you can enjoy the Super Quality Sound, listen to audio books in the bedroom at night or play music while cooking or doing exercise. ► LARGE CAPACITY RECHARGEABLE BATTERY: 4000mAh Large capacity battery, long playing time and long lighting time. Easy charged by USB Cable within 6 hours. Multifunctional creative and modern design make it the best gift choice on many occasions, such as Yoga, Party, Camping. ► 12/24H DIGITAL CALENDAR CLOCK: LED display, easy to read. 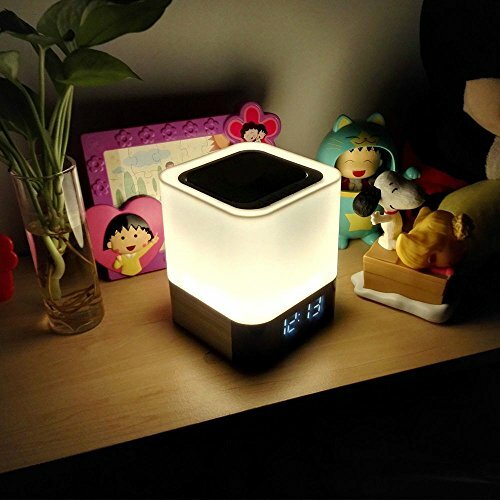 Support sleep mode, the lamp and speaker automatically turns off after setting. Built-in speakerphone, and microphone, answer calls easily. ► 100% BRAND NEW & QUALITY GUARANTEE: Our principle is giving customers the best, so I can promise every product is in good quality. 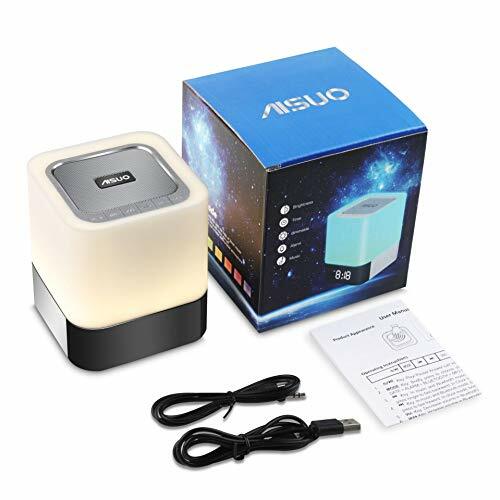 If you have any question about this item please leave us a message, Aisuo Customer Service will contact with you in 12 hours.